Greetings, we are glad that you have taken the time to explore joining the Boy Scouts of America! I know it was one of the greatest decisions I have personally made in my life. I look forward to meeting you and exploring our country being a scout. 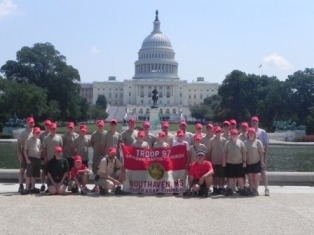 Whether it is hiking in the rocky mountains or sailing and scuba diving in the caribbean, our troop does it all. See you around the campfire! from our leader, Frank Brown! Since 1939, Troop Ole 97 has been committed to instilling lasting Christian values into young men of the next generation. Members of the troop learn how to become self-reliant, dependable, hard-working leaders - skills that shape the next generation. Today, we see active young men - tomorrow they are doctors, lawyers, firemen, businessmen, computer programmers, pilots, truck drivers, and mechanics. Request email access via the email request page. We are proud of our over 200+ Eagle Scouts. Browse the list and honor them all. It's a rich 70+ year history. See pictures, background and more. A distinguished way to dispose of unserviceable American flags.